We should preserve this guy for the next few generations so he continues to enthrall and entertain us with such wildly exciting books across a wide spread of genres. Period. He is one of the best writers out there – a prolific productivity, an inimitable sense of dark realism tinged with shiny hope and the gift to entertain through sheer imagination that knows no bounds. Upcoming Movies: MAD MAX : FURY ROAD – Official Warner Bros.
Long time back, Mel Gibson - before he became the Braveheart or the action hero-detective in the Lethal Weapon series - was synonymous with one name: MAD MAX. A road-warrior of the post-apocalyptic world. A trilogy of movies that were outrageously stylish and became cult hits in the early 80s. While the third movie was a stretch - Beyond the Thunderdome, by then the road-warrior Mad Max had become a cult-hero. We see the cult is beginning to revive. With the latest movie in that franchise helmed by George Miller coming out in 2015. I let you feast your eyes on the trailer. I loved this mad desolate dust-bowl world of blood and pain - trailer!! Let's hope the movie doesn't disappoint. High hopes riding on Tom Hardy and Charlize Theron. CornPunk Fantasy anyone? Yess..Please...Can I have sum-more? So a corn-punk fantasy? What in the name of blue blazes is that? "I posted on TerribleMinds at one point, saying, "Let's come up with some funny sub-genres." Something-punk. You know, this-punk and that-punk. Funny-punk. It's punk-punk. And I came up with "corn-punk." It's a future run on corn, ha ha. But then I thought, "Well, that's actually creepy, because corn is sorta scary these days." So I started extrapolating that, and I created this very sunny, dustbowl, agricultural dystopia in the far-flung future where corn has taken over. And it's about a young boy struggling against the rich people who live in big ships above his head." 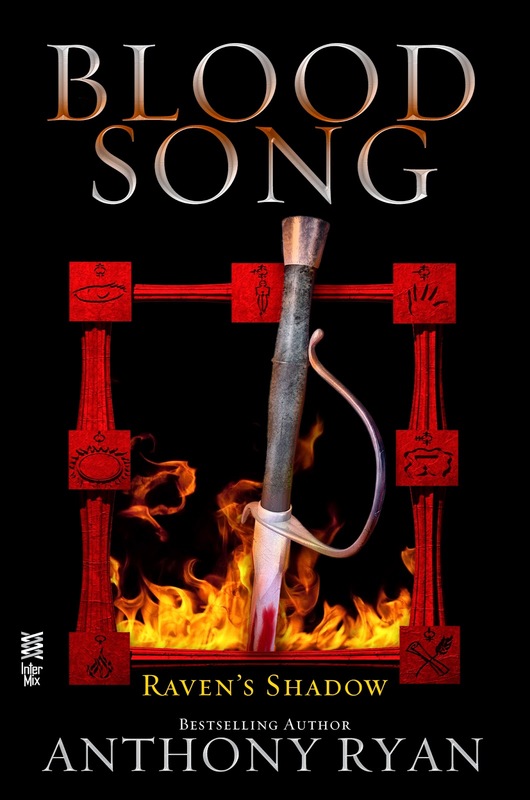 I must admit that Blood Song by Anthony Ryan came to my notice a long time back. Back in the end of 2012. When this explosive debut took the genre by storm with everybody calling it to the Best Book of the Year and beyond. But with the second book coming out now, The Tower Lord – the clamor for this book hasn't died down. If possible, it has only gone higher. And so I dutifully set down to discover why it became a phenomenon that any fantasy reader couldn't ignore anymore. To peel back the magnificent hype and the rabid following this book has gained over time. Well. Having read this now, I've got to say I have fallen under the magic myself. A surprisingly strong narrative pull and the intriguing charisma that oozes off the heroic Vaelin Al Sorna combines with the deft pacing and spectacular world building to make this book a winner at different levels. It's a book any fantasy fan worth his salt should be reading. MOVIE REVIEW: Guardians of the Galaxy - A goofy loopy ride full of fun. So looks like the good folks at Marvel finally got tired of the eternally brooding universe saving super heroes who always take themselves a bit too seriously. So they decided to let their hair loose, roll up their sleeves and have some good old fashioned fun. With Awesome Mix Vol.1 featuring the looniest and biggest pop-rock songs from the 70’s blaring in the background and making a spoof of the super-hero clichés with an unlikely bunch of rakish irreverent ragtag outfit who set out to guard the galaxy. The result? Guardians of the Galaxy. A fun-ride that never takes itself seriously – loaded with all things warm and fuzzy. Outrageous corny humour that actually fits in. A crackling camaraderie among the lead actors that blows the wind out of all bromances, romances and other mances (ahem. What do you call the undying friendship between a talking racoon and an over-grown tree? ), if you will. Boy Nobody or I am the Weapon was a book that caught my eye after Mihir from FBC and other fellow bloggers recommended it as a pretty addictive fast-paced thriller read. Mihir’s suggestions have been pretty spot-on and after having completed the excellent “Wayward Pines” trilogy – I was in the mood for something that’s light-duty and super-fast paced. Boy Nobody delivered and how! A compulsively readable YA thriller that reads like a runaway freight-train. Knocking you down with its intensity and emotionally jarring narrative. Featuring a teenage (late teens) soldier trained to be an assassin, the book runs straight as an arrow with a mission that goes a little awry and plugs the boy soldier’s world into chaos. And yes. It involves a girl. Morningside Fall by Jay Posey: A weak link to the trilogy ending. After having absolutely loved the opening salvo Three in the Legends of the Duskwalkers series by Jay Posey, I had my hopes sky-rocketing for the second book, Morningside Fall. Truths be told, after having set such a high-bar with the testosterone-filled opening featuring one of the most enigmatic heroes and having masterfully built up a suspenseful post-apocalyptic world with its own set of twists and horrors – It was always going to be a really tough deal for Jay. To surpass the stratospheric expectations. Three was a surprise debut for me last year. Delightful and punchy. Alas. Morningside Fall is a weak addition to the series. It's not really a series bridger - in the sense, we still are in the dark about the Legend of the Duskwalkers. I would like to place my bets on certain aspects, sure but things are still clouded and hazy. The dust hasn't settled yet and we await the conclusion to this series – that still retains its originality and brilliance. I had recently read The Detainee by Peter Liney - chronicling the adventures of the Big guy Clancy stuck on an island - where the old and infirm of a dystopian society are sent away - as garbage to rot the rest of their lives out. It was a powerful and emotionally draining book - a soul-searching attempt at questions around the devolution of human society and mind. I loved the book - the prose, the ideas and the wonderful execution. So with the second book in the series coming out - I am pretty excited that Peter actually agreed to do a guest post on what ideas influenced him to set upon writing this fascinating trilogy. I was asked recently what some of my more direct literary influences were for The Detainee Trilogy. Of course, like every other writer, there were many, but it got me thinking about what books had had a more subtle, lingering influence, and I came up with one rather surprising one: Don Quixote.